Well was really looking forward to this one and it certainly didn't disappoint! 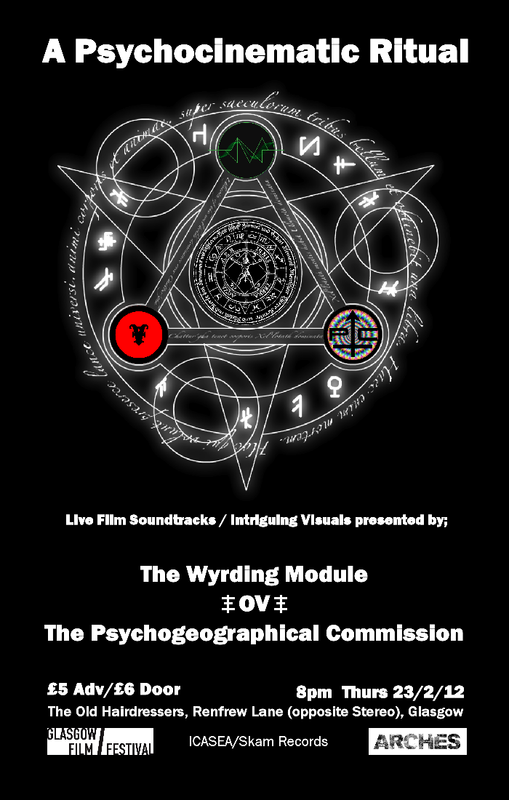 A Psychocinematic Ritual for the 2012 Glasgow Film Festival, featuring the debut performance by The Psychogeographical Commission, only the third ever performance by OV and The Wyrding Module headlining to top it all off! There's an absolutely fabulous 15 minute interview with p6 of OV and Stuart Silver from The Psychogeographical Commission on Scottish Television's website here: It's well worth checking out! They were followed by a special and very powerful set by OV performing a new, one-off performance of WAR on their 3rd ov only 23 planned performances - an excerpt from the piece in the video below. The final performance of the nite was by The Wyrding Module who started off with the ambient Mantra II and finished off with some fine beats stuf and excellent video (as seen in the promo above).